It seems that the 9th anniversary of this here blog came and went in mid-February without me giving it much thought. In fact, it seems that I mostly forgot about the 8th anniversary, too. I posted in 2011 to celebrate the 7th anniversary here, but have skipped the past two years. Well...because we're (now) closing in on ten years of *stuff* on the web, I thought it would be meaningful to at least take a pause and reflect on 9 years - even if it is three months late. As of this post, there are 1387 posts in the archives of JakeParrillo.com. Across 111 months, that leaves an average of 13ish posts per month. With the past few years providing almost a post a month, that tells me that there were some lean years (months) in there. I'm looking at you 2008. My life has come a long way. From a political hack to a daddyblogger (and political hack), my interests have clearly morphed to focus on gardening, pizza, family, and my community. 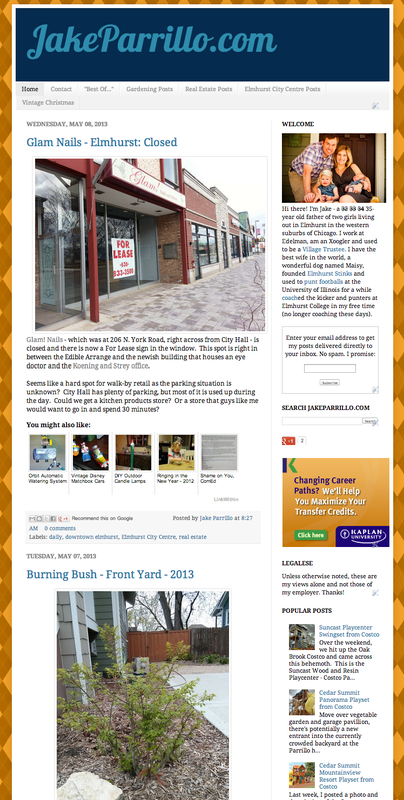 For posterity sake, here's what JakeParrillo.com looked like on this 9 year + 3 month birthday. You started your blog before we met! Pretty crazy... and we got married in 2008, so maybe I was keeping you busy. Yeah...2008 was a busy year. Kellogg, wedding, newish gig, etc.